As summer begins to wind down, a winemaker’s thoughts turn to the pending events to come in the next couple months. Harvest—it can be a dirty word for winemakers! But it’s the magical time of year when grapes start arriving at the winery and the whole process of making wine begins yet again. Am I ready? Nope….but the grapes don’t care! 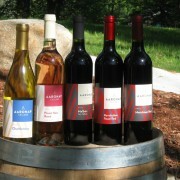 So what’s on tap for Aaronap Cellars’ winemaker in 2014? The main theme is to repeat most of what I did in 2013 but on slightly larger scale with a couple of new twists. I just took delivery of a couple of larger tanks with cooling jackets to produce more of the Massachusetts grown chardonnay and pinot noir rosé that you love. The cooling jackets will allow me to better control fermentation temperatures and retain the delicate aromatics that these grapes possess. They’ll also allow for easier cold stabilization prior to bottling, but that’s a story for another day. Red grapes? They’re coming too! My favorite Suisin Valley petite sirah, along with cabernet sauvignon, will be the star of the show, but California will also provide some excellent zinfandel from the Shenandoah Valley in Amador County. I’m heading north to Washington’s Yakima Valley to source merlot, cabernet franc, & syrah grapes. Closer to home, a very special vineyard in Rhode Island will lend some cabernet franc and merlot for the Revolution Road Red blend! As you can tell, a lot of grapes will be arriving shortly. California is about 3 weeks ahead of schedule this year due to the summer heat they’ve been experiencing. The drought will also impact the grapes with a more average sized harvest, but will also concentrate the flavors within the grapes. 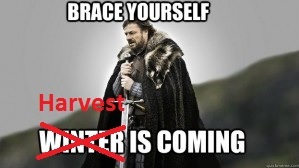 Washington is running on a little more normal harvest schedule (perhaps 1-2 weeks earlier than normal). Most of you have experienced the cooler New England summer that we’ve had this year and that means the chardonnay and pinot noir will likely arrive later than last year. In the midst of all those fermentations, we’ll also be emptying the 2013 wines from the barrels, blending, & bottling. Those will get stacked in the back of the storage room for another 6-9 months of bottle aging before release in (perhaps) spring. A busy fall is fast approaching! Come along for the ride and enjoy the fruits on my labor next spring! Wine Blends–Scary, Crap, or Excellent? The grapes are coming, the grapes are coming!